Delhi Haat is a cultural mini India packaged neatly for visitors. Here you are not only exposed to the handicraft items of all parts of India but also food from all the states of India. Additionaly occassional traditional and cultural functions are held here where you get to see traditional dance and music shows. 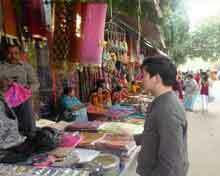 A small entrance fee ensures that Delhi Haat is a less crowded shopping area of Delhi. You can find traditional Indian gifts or souvenirs in abundance. A bit of batgaining too works here sometimes, but don't insit upon it. The rates are already reasonable. The layout is traditional and trendy at the same time. Chandni Chowk is Delhi's main wholesale market. This traditional market place facing the Lal Kila has an undying spirit and has kept itself updated so as the be the 'Aam Janta's' favourite over centuries. It is not only the shopping hub of Delhi but also an eateries hub of Delhi where you get eating joints that have a long history of their own. The 'Parathe Waali Gali' is famous hub in Chnadni chowk. Due to narrow meandering lanes you may have to take a rickshaw, but that will only add to the old world feeling. Shop, shop till you drop that's what most people do at Lajpat Nagar. Ladies are known to get carried away in this market where you have many mini malls. Its a favourite haunt of the 'Salwaar Kammej' crowd who get great and latest designs at reasonable prices. Other items like sandals and jeans and household goods too are in plenty. Indian tourist make it a must visit location in their tour program. 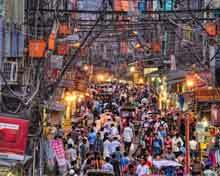 Another must visit itinerary for the Indian tourist is the Sarojini Market. This has cheaper options than even Lajpat Nagar but quality and quantity are lower. 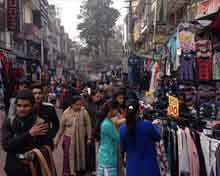 Sarojini Market is maily thronged for cheap T Shirts, Skirts and Jeans and Sweaters. These are available in export surplus stalls. Many times the rates are so dirt cheap that bargaining is not allowed. One needs patience here as you have to actually dig out stuff of your choice from piles of clothes. Since it is cheap and the quality not so great, people buy latest trends from here for a few wears, thus remaining trendy at a cheap rate. Food stalls here are no great shakes but very much there, for Delhi is known for eating out. 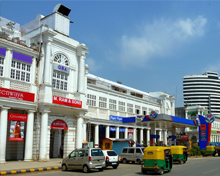 Shopping malls, bargain markets, sports boutiques, electronic gadgets, jewellery, art, leather goods, chinese cuisine, snacks, dhaba, cinema theatres, air tickets, banks, head offices, Connaught Place has it all. Connaught Circus, ats the centre of Connaught Place is another creation of Lutyens. CP consists two parts - Inner Circle and Janpath. 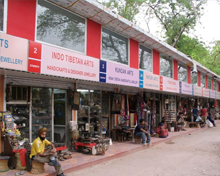 While the Inner Circle offers almost all the international brands, finest restaurants, eateries, bars and excellent bookshops, Janpath has small kiosks offering export surplus garments at very reasonable prices and curios such as silver and artificial jewellery in the small Tibetan shops. There are many state run emporia for genuine stuff. At the centre of all this is Palika Bazar - an air-conditioned underground market with parking facility. There are around 400 shops here and you can pick up many VCDs at throwaway prices here. CP is very near the railway station. Bargain shopping and Janpath go together. Located near Connaught Place, Janpath is where Indians and foreign tourists go bargaining for clothes, jewellery and interesting curios. Janpath is fashion trendy too. Bargaining is an integral part of enjoying shopping at Janpath. BArgaining can start at almost 3/4th the cost and worked upwards. Janpath is one of Delhi's popular souvenir markets. Patience is the keyword, and the large number of reasonably priced Fast food outlets more than make up for it. Nehru Place in South Delhi, is a commercial area, dominated by computer hardware and software companies. Nehru Place, is where you go for cheap CD's of computer games, movies, and software etc. Here you get second hand books too. Nehru Place is dotted with small eateries and street food vendors, very popular with the executives working there and visitors.